Rose Namajunas might want to look over her shoulder because a new contender is coming for her title after Tatiana Suarez absolutely demolished former champion Carla Esparza at UFC 228 on Saturday night. Suarez has often been called one of the best prospects in the sport but she’s shed that label with back-to-back finishes over Esparza and Alexa Grasso to rocket her way up the top 10 rankings. While she’s had nothing but lopsided performances since joining the UFC roster, Suarez doing the same thing to a fighter like Esparza definitely puts her into the conversation as the next contender in the 115-pound division. As the fight got underway, Esparza decided to try her hand at a takedown but Suarez quickly reversed the position and took the former champion down to the mat. From there it was all Suarez as the former Olympic hopeful just bludgeoned Esparza with punches and elbows from the top as she put on an absolutely punishing performance on top. 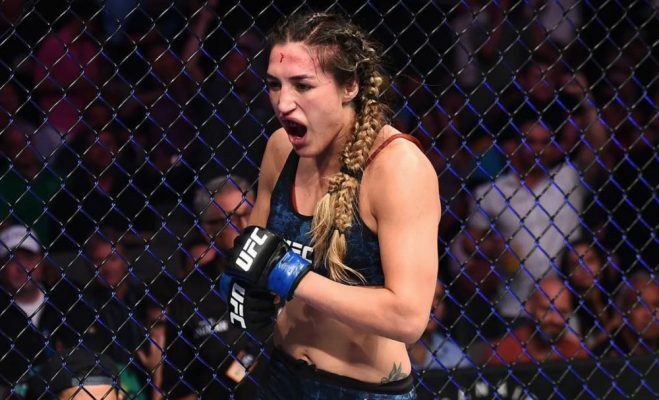 By the midway point of the round, Esparza had several contusions swelling on her face after eating so much damage from Suarez’s ground and pound attack. Esparza survived the round but Suarez certainly wasn’t going to slow down as she immediately swooped in for another takedown to continue putting the pressure on. Suarez was just mauling Esparza with her takedowns and ground control with the former strawweight queen just lost on the bottom while trying to survive. With just over a minute to go in the round, Esparza was finally able to escape but she couldn’t avoid the forward pressure as Suarez immediately put her back down on the mat. It was more of the same in the final round with Suarez planting Esparza on the mat and just blasting away with short inside elbows and punches against the cage. With less than a minute to go, Suarez moved into mount and just started blasting away with a barrage of shots and Esparza had nowhere to go. Finally after so many unanswered shots were just hammering away at Esparza, the referee decided to stop the carnage to give Suarez the TKO victory at 4:33 into the final round. Suarez is now 7-0 in her career with four straight wins in the UFC. With her latest performance against a former champion, it’s going to be awfully hard to keep her away from either a title shot in the near future or at worst a No. 1 contender’s bout when she makes her return to action.